What is the National Bird of Sweden? The national bird of Sweden is the Blackbird Turdus merula, otherwise known as the Common Blackbird or Eurasian Blackbird, though, of course, in Sweden it is not known by any of those names but as Koltrast. * The Blackbird became the Swedish national bird as a result of a newspaper poll in 1962. Beyond the charisma and song of the species it is unclear why the Swedish people chose the Koltrast as their national bird. It is common in Sweden but so are many other species. Despite my inability to figure out why, exactly, Sweden chose the Blackbird it seems like an excellent choice, especially if one likes The Beatles. For the record, and in case some folks from the United States read this and don’t know, the Blackbird being referenced here is actually a thrush, like our American Robins. 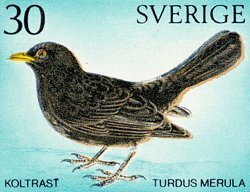 Sweden is one of at least three countries that has a thrush as the national bird (Malta and Costa Rica do as well), but Sweden is the only country to have so honored Turdus merula. *In different parts of Sweden there are different regional names including Svarttrast, Svartstare, Gråstare, Svartklera, Buskstare, Solsvärta, and Muskvipa. Want to see all of the national bird posts on 10,000 Birds? Click on our National Birds page! 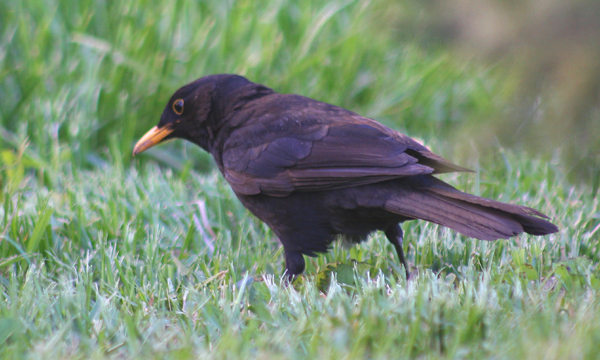 Blackbirds used to be a forest bird but changed its habitat to live in our gardens and parks. Now it is a bird seen by most Swedes everyday and is loved for its song. It stays thru our harsh winters and is a frequent guest at our birdfeeders. Maybe its familiarity made it a winner!